On the plane back home from our honeymoon, as we discussed what we needed to do to get reorganized and hit the ground the running when we landed, Harper said to me, “I want to eat less meat this year, and when we eat meat, I want it to be good meat.” This is something we both have strived to do for a number of years but we’ve always let circumstances throw us off track. This year we’re determined to see that pledge through, and luckily for us we live in Durham, North Carolina. We are surrounded by farmers markets, small farms, and local meat and produce at every turn. We don’t have to drive for miles or hours to find sustainably-raised, responsible meats - we can go down to the Durham Farmers Market on a Saturday morning or pop into the Durham Coop on a weekday evening and find pretty much anything we could want. One of our favorite local companies is Firsthand Foods. They work with small farmers from Central and Eastern North Carolina to source ethically-raised, pasture-based beef, pork, and lamb. They purchase whole animals and work with local companies to process the meat and get it to the market. This means more money in the pockets of the farmers, a better end product for the consumer, and a higher quality of life for the animal. This year we are excited to announce that we are partnering with Firsthand Foods to help them promote locally raised, sustainable meat products and their (M)Eat Local Box. The box is a monthly subscription of some of their amazing pasture-raised pork and beef products, from the familiar like steaks and sausages, to the unique like pork shanks and country style ribs. Each month we’ll work* with the amazing women at Firsthand (did we mention its 100% woman-owned!?) to develop a recipe (or two) for that month’s box. We’ve got a year’s worth of a local meat ahead of a us and we’re ready to get cooking! A Manhattan Roast is essentially four New York Strip steaks together. This beautiful cut of meat is the perfect piece to pull out for a dinner party or special occasion. Now you could always cut the roast into steaks and fire up the grill, but we think an elegant piece of meat like this deserves a little extra effort. There are two unique steps that may seem a little odd at first, but we encourage you to give them a try. The dry cure we recommend will help enhance that amazing steak flavor and allow for a fully-seasoned, tender piece of meat. 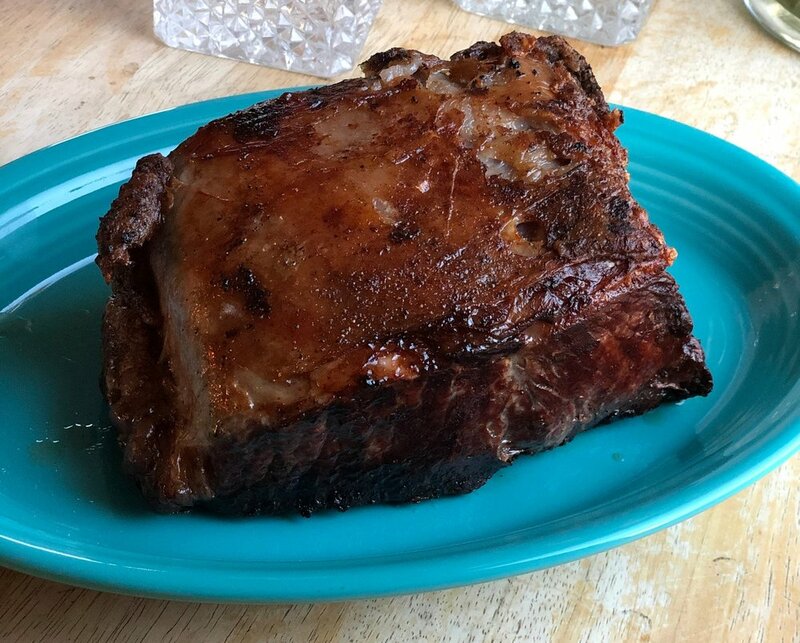 By baking it before you sear it you can better guarantee a great medium-rare to medium cook temperature throughout the roast and still achieve that gorgeous brown crust on the outside. A dry-brine in the friddge is the perfect way to get extra “oomph” out of a cut of meat. Coat the bottom of a heavy ovenproof skillet (cast-iron works best here) with a few tablespoons of olive oil. Arrange the roast in the center of the pan, fat-side up. Take the head of garlic and chop off the top, about ¼ of the way down from the tip. Place it on a square of aluminum foil, drizzle the whole thing with olive oil and sprinkle with some kosher salt, and wrap it in the foil. Tuck the head of garlic into the pan next to the roast, cut side up. Bake the roast and the garlic in the preheated oven for about 40 minutes to one hour, until the internal temperature of the roast reads 120F on a meat thermometer. You can start checking the meat at the 40 minute mark. You may need to take the temperature in a few different places, just aim for an average temperature of around 120. Meanwhile wipe any excess dirt from the mushrooms and cut them into ¼ inch thick slices. Set aside. Once the roast has reached temperature carefully remove the skillet from the oven (set the garlic aside). Pour any accumulated fat and pan juices left in the skillet into a heatproof container, then spoon about two tablespoons of the fat back into the skillet along with two tablespoons of olive oil. Place the pan on the stovetop over medium-high heat. Using a sturdy pair of tongs to help turn the roast, brown it on all sides. You’re looking for a nice dark crust, it may take 2-3 minutes per side. Once finished carefully remove the roast from the skillet and set aside on a clean platter or cutting board. Add an additional tablespoon of the fat to the skillet if its looking dry. Put the skillet back over medium-high heat and add the mushrooms. Cook, stirring frequently, for 5-7 minutes until they begin to brown. While the mushrooms cook, skim off any remaining fat from what you poured out of the skillet, keeping as much of the roasting juices as possible. Once the mushrooms have started to brown, unwrap the head of garlic and squeeze the cloves into the skillet. Add the leftover roasting juices, heavy cream, and sprig of thyme or rosemary (if using). Season the whole thing with salt and pepper and cook, stirring frequently, for another 3-5 minutes or until the liquid has reduced by about half and you have a gravy-like consistency. Remove from the heat, discard the sprig, and pour into a serving pitcher or bowl. Slice the roast width-wise as if you were cutting it into ½ inch-thick steaks. Arrange the slices on a platter and spoon some of the roasted garlic and mushroom sauce over. Serve while still warm, with additional sauce on the side. * This recipe series is sponsored by Firsthand Foods. We receive a complimentary M(Eat) Local Box each month in exchange for producing a recipe from its contents.